Hey Jammers! 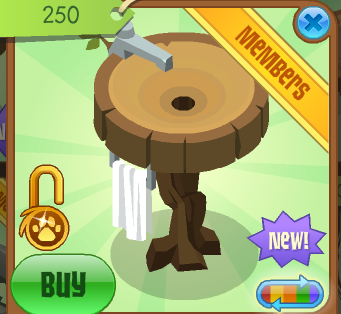 Today's new item is a Tree Stump Sink! Well that's all (I think) for today. Please comment if I missed something. Hey, whats! I HAVE SOME COOL NEWS! I got a lion card for my original account, missprettytiger01! Well, not really a lion card... I got a lion code, by giving my grandma money for her to by a lion membership online. But anyway, you know what I mean. Will you add me on that account? Thanks. Snowyclaw won the daily explorer fox facts contest! Just in case you didnt know, Animal Jam and The Daily Explorer are shut down right now :( BUT my membership on another website SOMEHOW hasn't expired, so I'm playing on that (you need to pay to play) I'm supprised they didn't get rid of my account.